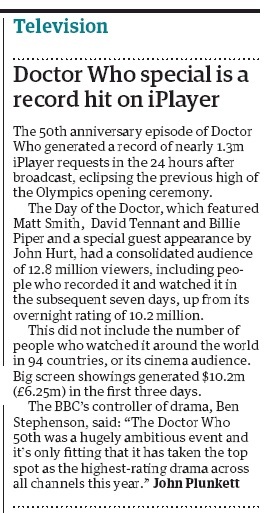 The 50th anniversary episode of Doctor Who generated a record of nearly 1.3m iPlayer requests in the 24 hours after broadcast, eclipsing the previous high of the Olympics opening ceremony. The Day of the Doctor, which featured Matt Smith, David Tennant and Billie Piper and a special guest appearance by John Hurt, had a consolidated audience of 12.8 million viewers, including people who recorded it and watched it in the subsequent seven days, up from its overnight rating of 10.2 million. This did not include the number of people who watched it around the world in 94 countries, or its cinema audience. Big screen showings generated $10.2m (£6.25m) in the first three days. The BBC's controller of drama, Ben Stephenson, said: "The Doctor Who 50th was a hugely ambitious event and it's only fitting that it has taken the top spot as the highest-rating drama across all channels this year." APA 6th ed. : Plunkett, John (2013-12-03). Doctor Who special is a hit on iPlayer. The Guardian p. 18. MLA 7th ed. : Plunkett, John. "Doctor Who special is a hit on iPlayer." The Guardian [add city] 2013-12-03, 18. Print. Turabian: Plunkett, John. "Doctor Who special is a hit on iPlayer." The Guardian, 2013-12-03, section, 18 edition. This page was last modified on 17 May 2014, at 15:46.